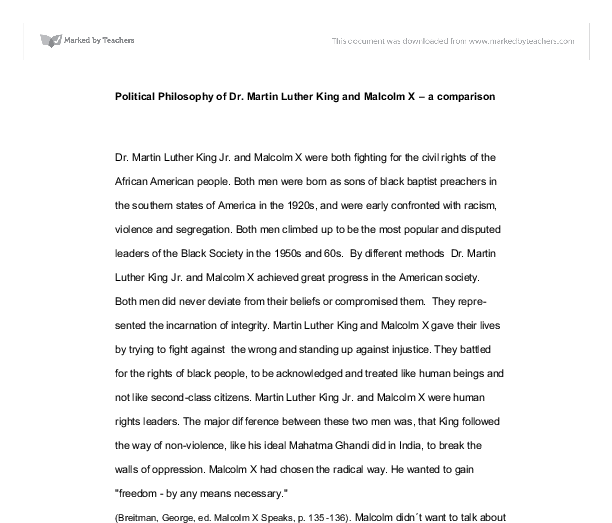 Political Philosophy of Dr. Martin Luther King and Malcolm X - a comparison. 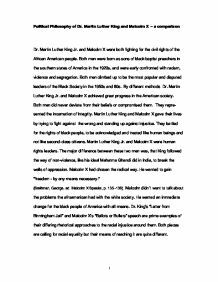 Political Philosophy of Dr. Martin Luther King and Malcolm X - a comparison Dr. Martin Luther King Jr. and Malcolm X were both fighting for the civil rights of the African American people. Both men were born as sons of black baptist preachers in the southern states of America in the 1920s, and were early confronted with racism, violence and segregation. Both men climbed up to be the most popular and disputed leaders of the Black Society in the 1950s and 60s. By different methods Dr. Martin Luther King Jr. and Malcolm X achieved great progress in the American society. Both men did never deviate from their beliefs or compromised them. They repre-sented the incarnation of integrity. Martin Luther King and Malcolm X gave their lives by trying to fight against the wrong and standing up against injustice. They battled for the rights of black people, to be acknowledged and treated like human beings and not like second-class citizens. Martin Luther King Jr. and Malcolm X were human rights leaders. The major difference between these two men was, that King followed the way of non-violence, like his ideal Mahatma Ghandi did in India, to break the walls of oppression. Malcolm X had chosen the radical way. He wanted to gain "freedom - by any means necessary." (Breitman, George, ed. Malcolm X Speaks, p. 135-136). Malcolm didn�t want to talk about the problems the afroamerican had with the white society. He wanted an immediate change for the black people of America with all means. ...read more. They were fighting for their rights and freedom, but seeing little in exchange for their efforts. They claimed for a more radical leader who would be able to understand them. The most influential and charismatic leader of the black underclass and youth was Malcolm X. Malcolm was born as Malcolm Little on May 19th, 1925 to Georgia Baptist minister James Earl Little and M. Louise Little. Like Martin Luther King, Malcolm was influenced by his father who followed the teachings of Marcus Garvey. His father James believed in black nationalism and pride. He was murdered by the Black Legion, a part of the Ku Klux Klan(KKK), when Malcolm was six years old. He struggled to exist as an African-American in an Anglo-Saxon society. When his mother Louise was sent to a mental asylum, her children became foster children. Malcolm was the only black student at Mason Junior High. The turning point in his life occurred when an English teacher told him to strive to be a carpenter rather than a lawyer, because of his skin colour. He left school, after finishing grade eight, to live with his sister Ella Mae Little Collins in Boston. After doing some odd jobs in Boston Malcolm went to Harlem, where he learned to survive in the ghetto as a hustler. On the street he was known as 'Detroit Red' due to his redly hair colour . He became dependent on drugs, got into trouble with other hustlers and returned to Boston to organize a burglary ring. ...read more. Dr. King grew up in a middle-class family, went to university and was well educated. He encouraged nonviolence and supported passive resistance. Malcolm was comming from the ghetto demanding justice for African-Americans. For both men religion was the center of their lives. Their turning points shaped their futures, Dr. King�s being the Montgomery Bus Boycott and Malcolm X�s being the finding of the Nation of Islam(NoI). Actually, they met once at the United State's Senate debate on the Civil Rights Bill on March 26, 1964. Towards the end, they moved closer. Both men criticized each other, but also highly respected one another. Martin Luther King and Malcolm X fought againt second-class citizenship, inhumanity and preached to vote and joining organizations. They were willing in ending poverty and discrimination. King and Malcolm established international links and organisations all over the world. Malcolm's famous slogan "by any means necessary" represented achieving his dream of freedom at any cost even death. Both were fighting with enthusiasm and a new hope for a better society and world. King dreamed of a society of peace, justice, freedom and equality. They became Ideals for African-American youth and achieved much with their efforts. Today, they are admired as martyrs of equality, who might have been able to do more if they hadn't been killed so early. They both represented equally good human rights leaders. One method did not work better than the other. Their two ways worked for the people who followed them. They introduced self-pride representatives of the African-American population. Dr. King and Malcolm X died trying to improve the conditions of living in their country in accordance with the American constitution. ...read more. self-confidence and control these were two of the most important elements of King's personality. King also demonstrated a realistic outlook; he knew that there was a constant need to know the status of things. He was idealistic, honest and acted with straightforward abruptness and he expected others around him to act the same. Malcolm X and Martin Luther King: Compared and Contrasted. The two men where fantastic speakers, and had many great speeches, the most famous being Martin Luther King's 'I have a dream' speech. Malcolm X's speeches were more for the black people in ghettos. He had a great response from them, because he knew what they were going through and how they felt. He would get carried away in the moment this was especially apparent in his speeches he would explain he was on a mission and was prepared to die for the cause. He went to places which were very dangerous despite being given numerous death threats warning him not to go there. Muhammad also taught that the white people wanted to keep the African-Americans from empowering among themselves and achieving political, economical and social success. Malcolm was also taught that Christianity was a white persons religion, which was used to overpower the blacks by promising them heaven after death, while enjoying his heaven right here on earth. The USA 1941 - 80 : The Divided Union. The cost was estimated at 140,000,000 US Dollars. * The following summer brought major outbreaks in LA, San Francisco, Detroit, Chicago and NYC. All of these riots were merely a prelude to what occurred in 1967. * In July 1967 terror struck in Newark, New Jersey where 200,000 lived in squalid slum conditions.